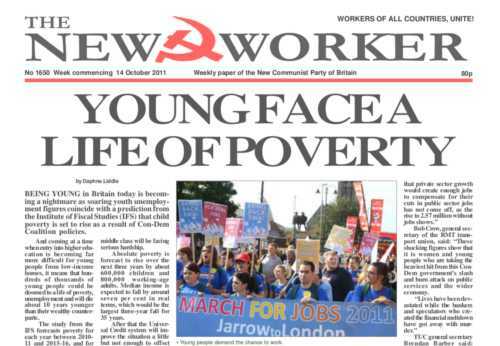 www.newworker.org | 14th October 2011 - Young face a life of poverty. BEING YOUNG in Britain today is becoming a nightmare as soaring youth unemployment figures coincide with a prediction from the Institute of Fiscal Studies (IFS) that child poverty is set to rise as a result of Con-Dem Coalition policies.. FIERCE fighting continues in Sirte as loyalist forces continue to repel Libyan rebel attempts to take over the only Mediterranean port still held by the Gaddafi government. Colonel Gaddafi has called on the people to rise up in mass resistance to the puppet regime and their Nato masters. On the post-Soviet Union area the anticommunist hysteria is in full swing again. On the eve of the anniversary of the Soviet power execution in Moscow in 1993 a court in Kazakhstan has suspended the activity of the Communist Party. LAST FRIDAY marked the 10th anniversary of the British military deployment in Afghanistan. On 7th October 2001 Anglo-American imperialism invaded Afghanistan to kick out the Taliban regime, which had provided a safe haven for the Al Qaeda terror network held responsible for the 9/11 attacks on New York and the Pentagon.